The first show of PJ20 festival. 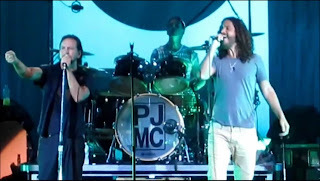 The set-list was extraordinary special, packed with rare songs, with many many guests on stage with Pearl Jam, duetting, trioing, quartetting or just crowding, including Temple Of The Dog reunion doing 4 songs (they have never ever played such a long set since their formation in 1990). The most notable live debute was an old Mother Love Bone song "Stardog Champion" with Chris Cornell on lead vocals. Another live debut was an obscure "In The Moonlight" song never played before. Also Eddie Vedder premierred his "Into The Wild" song "Setting Forth" with the full band. Definitely a must-have video! This is an audience multi-camera edited video of the entire show, by AP. Thanks so Much for share this!! extabit links doesn't work ! Could you check it ?? could you please made others mirrors for these files, I have a problem for download from extrabit, I can only download about 24kb/s. I´s possible to have these files on others server? Mike - as one of the people who contributed footage to Animal Projects for their PJ20 releases, could you PLEASE remove your comments indicating this is a YouTube sourced release? Granted, many of us have our vidoes on YouTube but the releases put out by AP are based on raw video files, not degraded YT rips. Thanks for spreading the jam. Sorry, guys, I fucked up! Best of the respects for the AP team and their effort! melhor blog para baixar dvds do PJ. muito bom mesmo. Obrigado. File "2011_East_Troy_1_(HD).part08.rar" appears to be missing. Can you fix this?